string(69) "Smarty error: unable to read resource: "globalcontent:buyjuansweeney""
Little is known about the life of Juan Sweeney de las Minas de Cobre. He grew up between Andalusia, Ireland, Oklahoma and Bolivia, lived centuries ago and has yet to be born. From what can be gathered, Sweeney’s books included Instructions to My Translator, Wet Book of the Otter, The Iconoclast’s Secret Window, and Shouts from the Copper Mines. All that remains of Juan Sweeney’s vast production are the fragments contained here. Sweeney famously claimed that he thought in English but wrote in Spanish, so that the executioners of the Inquisition and the future fascists of the Spanish Civil War would “choke to death” on his poems. For this reason, I have committed to translating Juan Sweeney’s poems back into English, the language of his thoughts. Admittedly, I do not like his poetry much and have tried to improve on it when possible. Nevertheless, the work of Juan Sweeney de las Minas de Cobre has branded me forever, and I cannot look away. como cuidarían a un cementerio. barriendo la arena de la playa. as one would tend a cemetery. 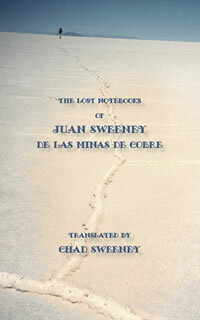 The Lost Notebooks of Juan Sweeney / Chad Sweeney from Leigh Stein on Vimeo. #3 from the Lost Notebooks of Juan Sweeney, read by Elizabeth Iannaci. Chad Sweeney is the author of Parable of Hide and Seek (Alice James, 2010), Arranging the Blaze (Anhinga, 2009), An Architecture (BlazeVox, 2007) and A Mirror to Shatter the Hammer (Tarpaulin Sky, 2006). He is co-editor of Parthenon West Review and editor of the City Lights anthology Days I Moved Through Ordinary Sounds: the Teachers of WritersCorps in Poetry and Prose. He lives in Kalamazoo with his wife, Jennifer K. Sweeney.